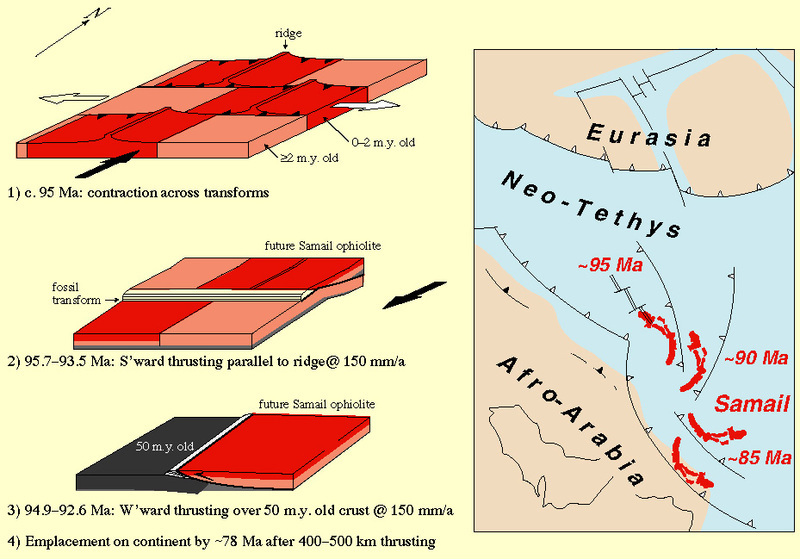 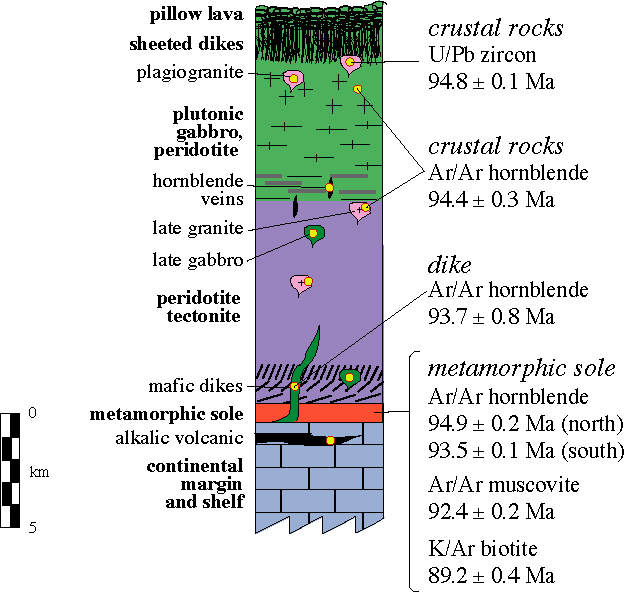 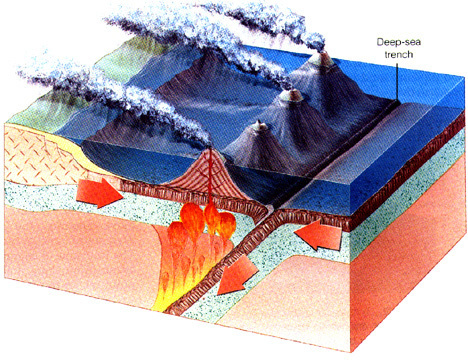 There was a brief introduction to plate tectonics and metamorphism at the beginning of this class. 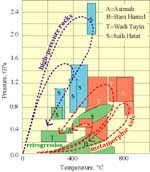 Now let's consider this issue in more detail. 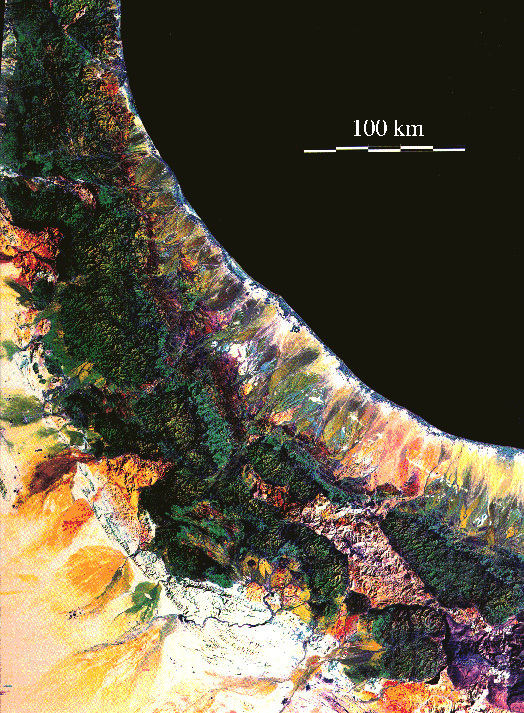 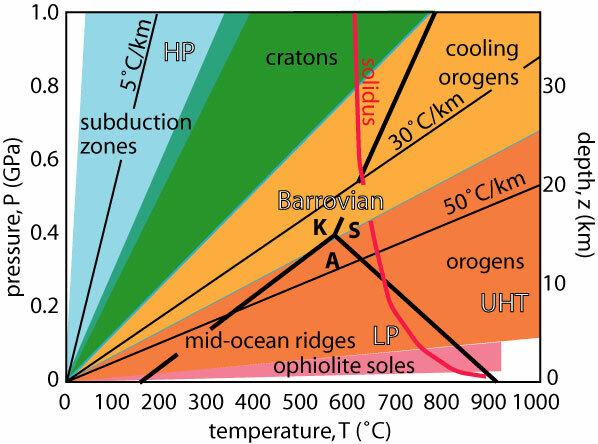 stable cratons (green): cratons are stable and relatively cold, with 'normal' thermal gradients of ~20 K/km. 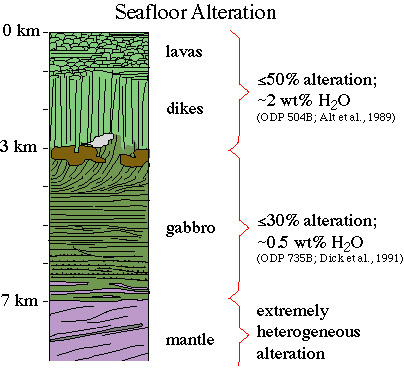 In detail, this simplification is incorrect. 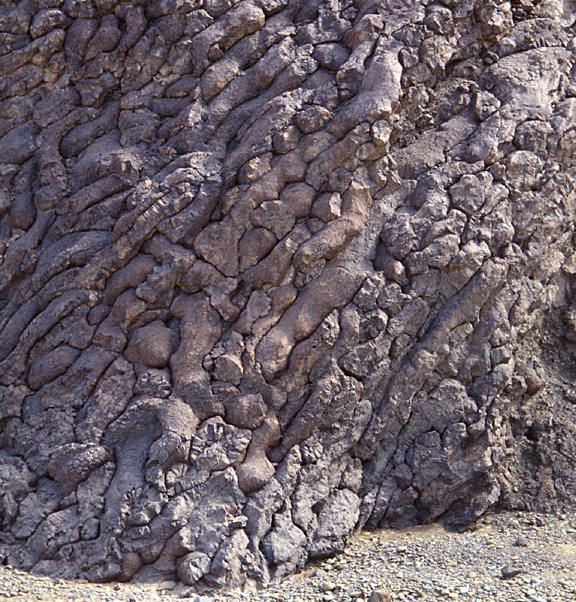 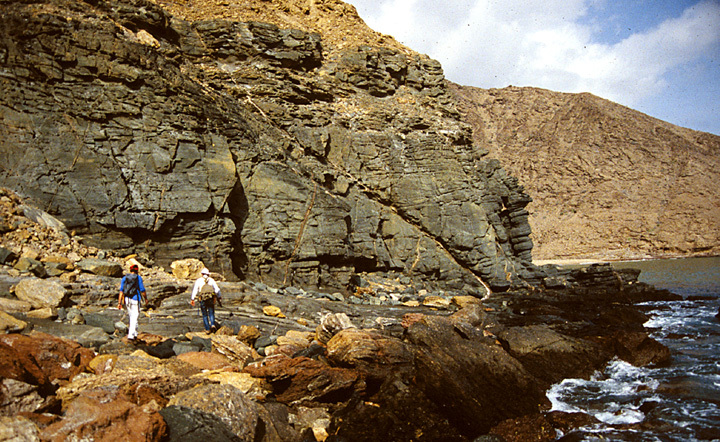 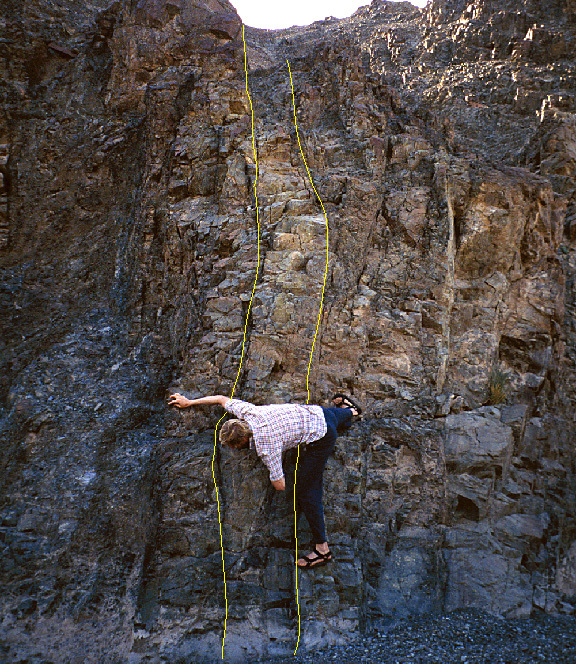 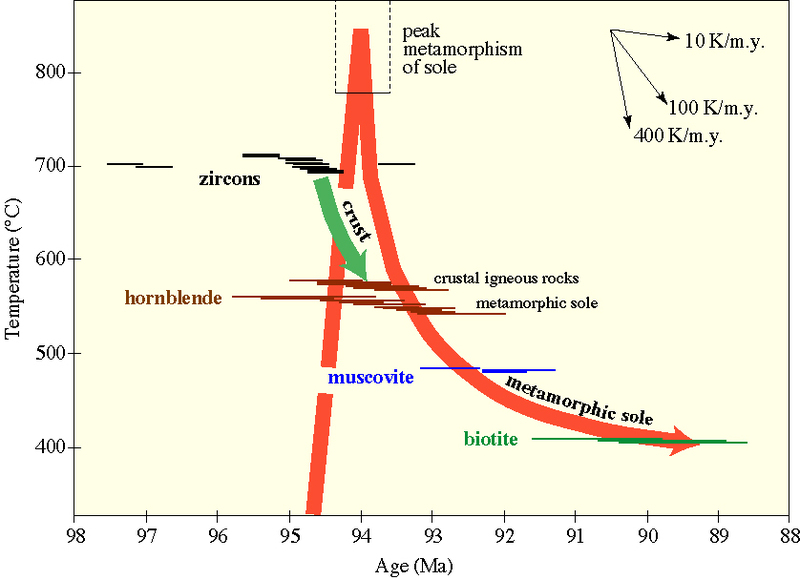 Continental rocks usually begin life somewhat hotter than this as a result of crustal stacking and radiogenic heat generation, but then cool over time. 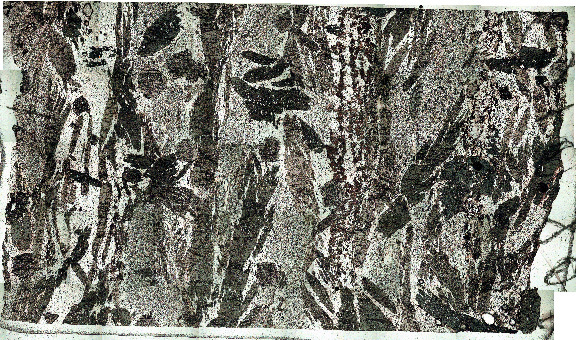 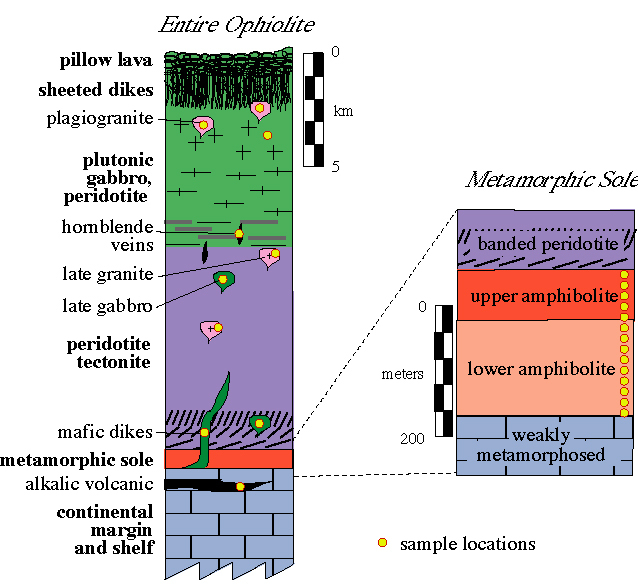 Many good examples of seafloor metamorphism are known from ophiolites in the Sierra Nevada and Klamaths. 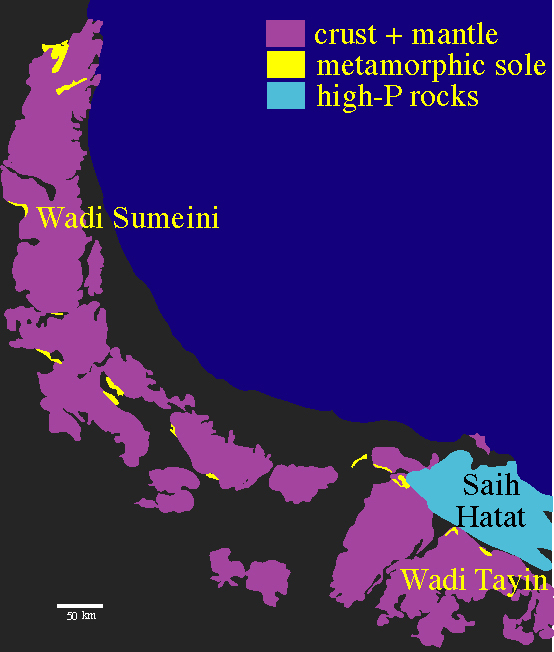 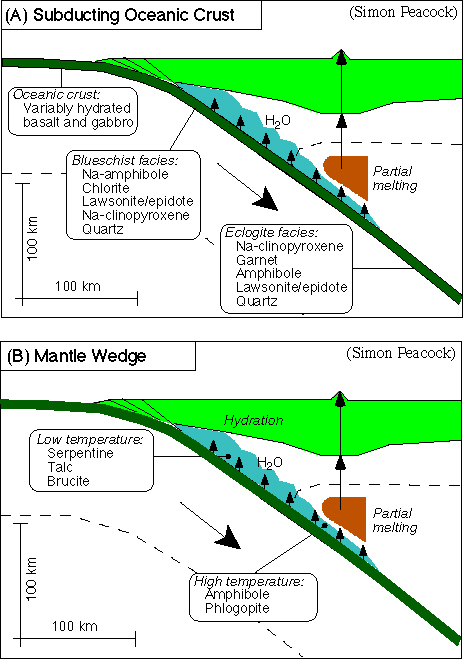 Rapid subduction advects cold material into the mantle, producing high P/T metamorphism (blue), sometimes called "Franciscan-type" or "Sambagawa-type" in reference to two classic examples in California and Japan. 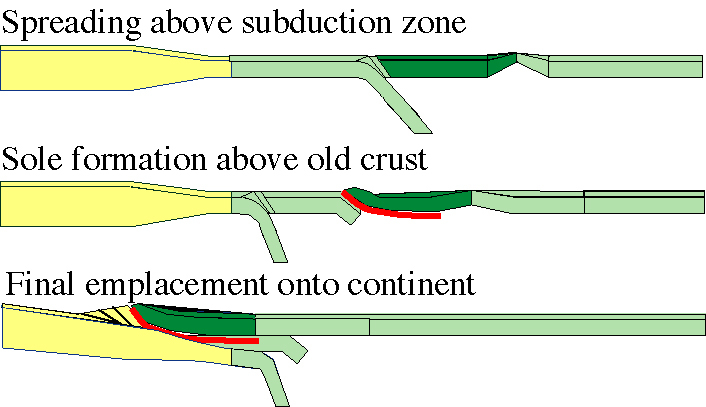 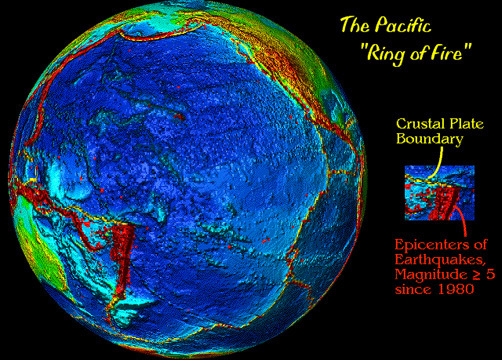 The "coldness" of the subduction zone depends on the age of the plate (older = colder) and the rate of subduction (faster = colder). 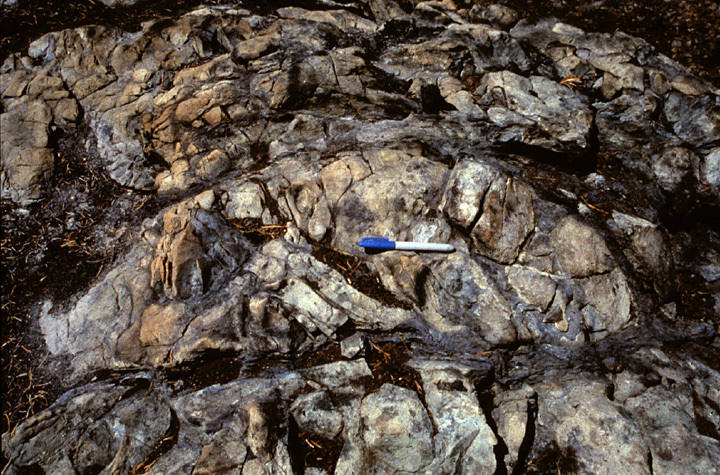 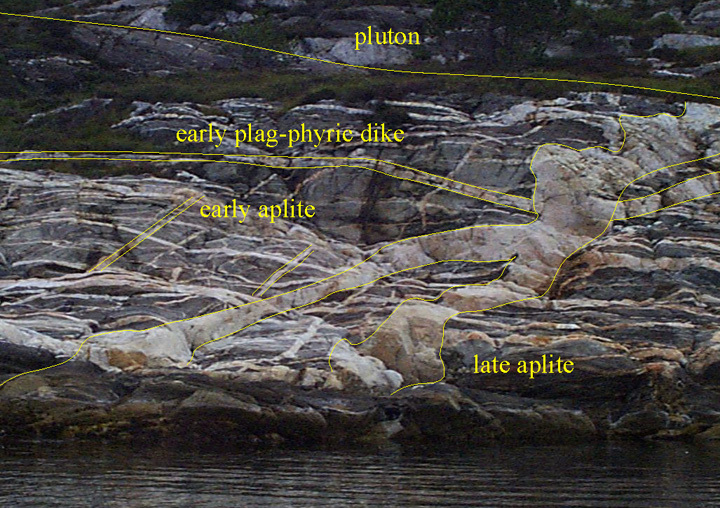 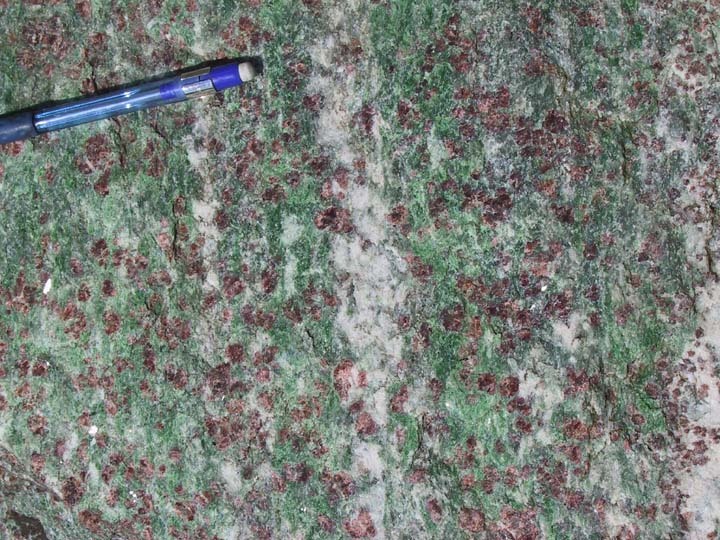 Eclogites are the signature rocks of this process. 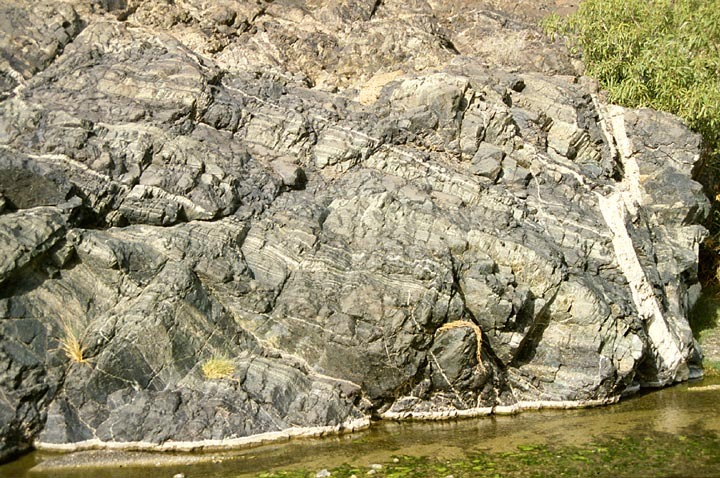 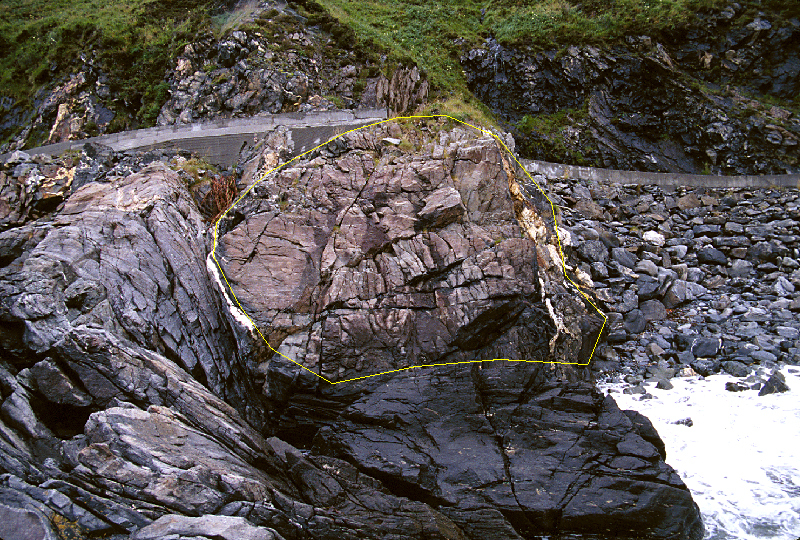 The signature rocks of high-pressure metamorphism and blueschists and eclogites. 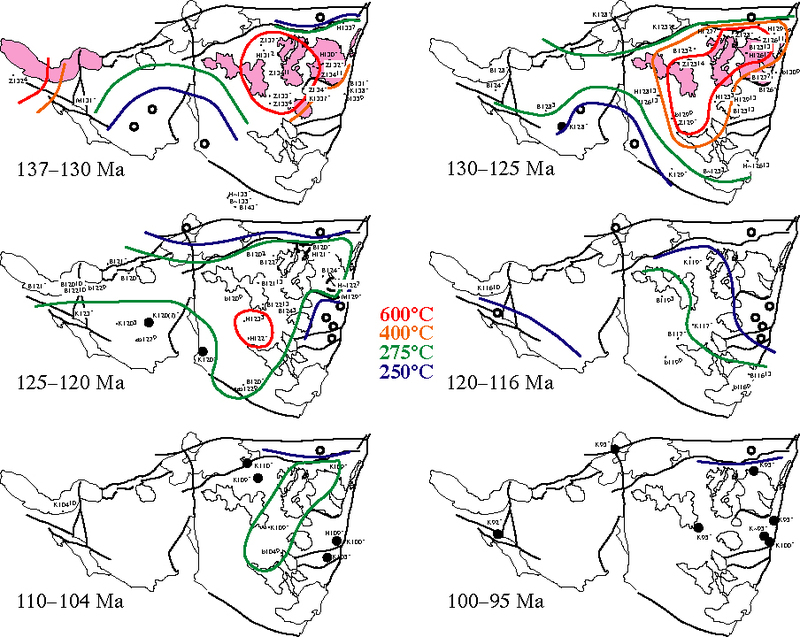 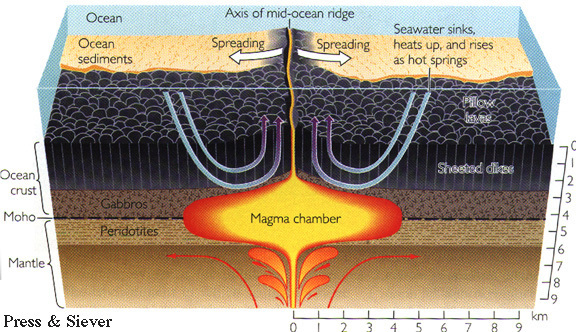 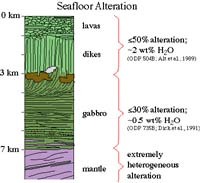 "Warm" subduction zones--a result of slow subduction and/or young subducted lithosphere and "cold" subduction zones-- a result of rapid subduction and/or old subducted lithosphere, have different thermal regimes, dehydration depths, mantle wedge temperatures and circulation, and styles of volcanism. 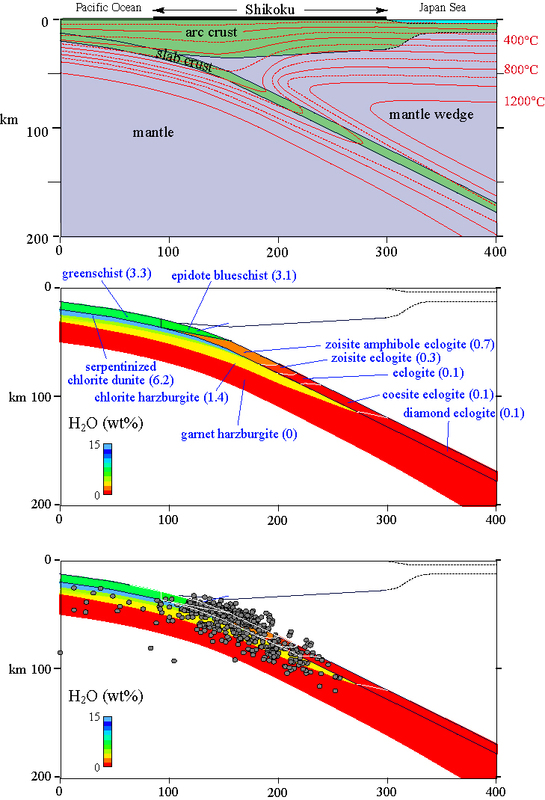 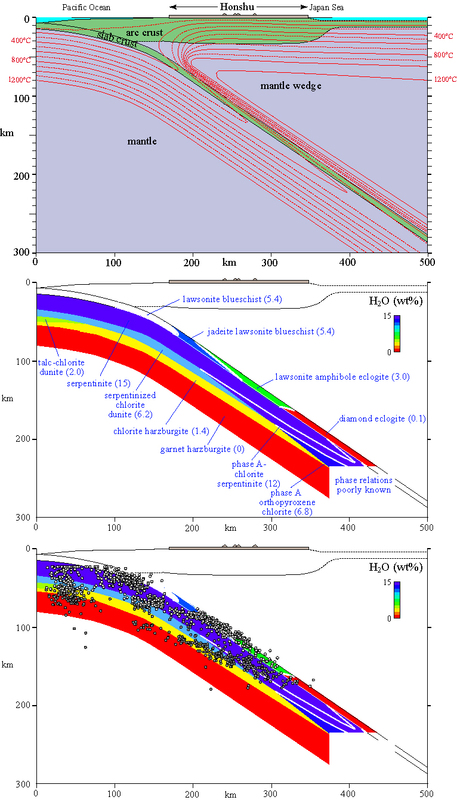 Recall that the characteristic diffusion distance for a thermal pulse to move over a 1 Ma time frame is ~5 km. This is an average movement rate of 5 km/Ma. 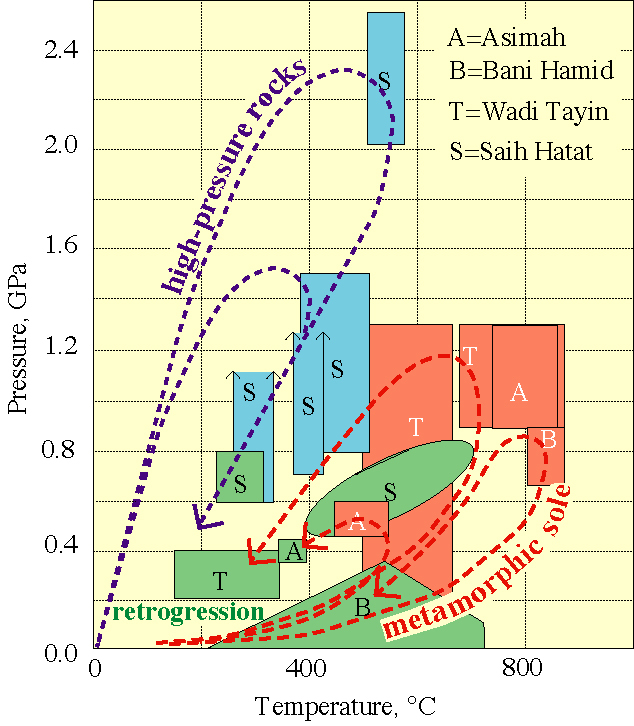 Thus, a steady state thermal regime cannot be disturbed by advection that is slower than this, because the thermal diffusion is able to "iron out" the effects of diffusion. If, however, the advection rate is faster, the thermal regime will be disturbed, and, in the case of subduction zones, will lead to an inverted thermal gradient. 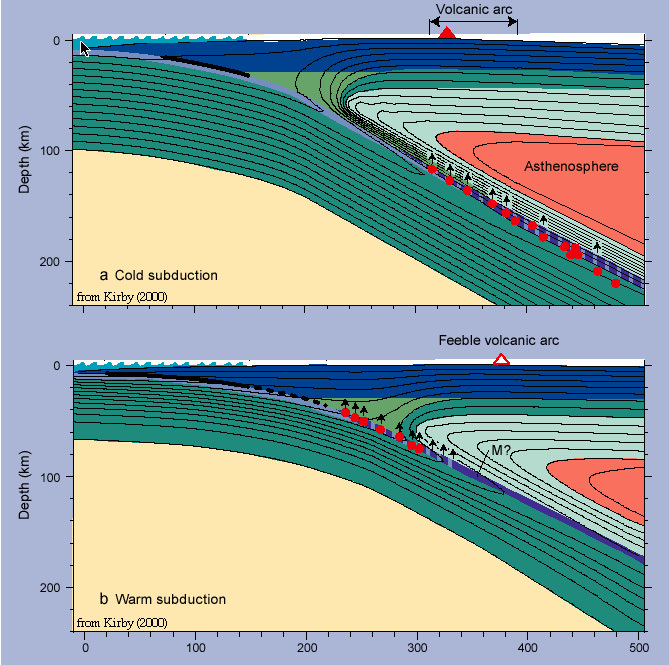 This ratio between the effects of conduction and advection is called the Peclet number.